Location: St. Josaphat Cathedral – 10825 97 Street Northwest Edmonton, AB. Description: This retreat takes place on Palm Sunday evening and is focused toward those aged 16-35. Bishop David will lead up in retreat and our journey through holy week.. Participants have the opportunity to meet with other young people to discuss elements of our faith.. This retreat will include Sacrament of Reconciliation, and will finish with the Forgiveness Service. Every January over 1200 school children from the 4 Catholic Elementary schools come to Holy Spirit Parish to bless water, to celebrate the Divine Liturgy and to grow closer to God. During the homily Fr. Bo and his trusty side-kick Marilyn (the Catechetical Puppet), explained the theology of “blessing stuff”. Here is a picture of the backs of everyone’s heads at one of the services. Also present was Fr. Louis from St. Anthony’s RC Parish. Does your parish youth group have a website, face-book account or some other online presence? If so we want to know about it! Here are a couple youth websites that we’d like to show you. Most parishes have programs where they teach, play with and pray with their kids. Part of the mission of the Youth Ministry Office is to support parishes in our Eparchy in this type of ministry. If you would like help setting up events in your parish, or if you would like to know what is going on in a parish near you, please contact Millie the Director. Below is a short little video of some kids attending Holy Spirit Parish in Lloydminster’s “Kid’s Club”. In the video you will hear them laugh as they race to pass smarties from one bowl to another without using their hands. The Kid’s Club at this parish meets every few weeks on Fridays after school in the parish basement. In addition to visiting and playing fun games, they also do singing practice, altar serving practice, they study about their faith by using the “God with Us” series, and they eat. Wow do they ever eat. Please mark your calendar for August 16th to 19th 2012. Into the Wild Unity 2012 at Pinawa Manitoba. Please check out the Unity website unity2012.wordpress.com for more information or call Millie Schietzsch Youth Director @ 780-424-5496 or email youth@edmontoneparchy.com. Unity 2012 is a Ukrainian Catholic national gathering of young adults to further understand, embrace and celebrate our faith through prayer, education and fellowship. Through keynotes, prayer, personal witnesses and workshops we will be exploring the theme, Into the Wild. The theme is inspired in part by our surroundings. We are gathering at Wilderness Edge Retreat Center, which is surrounded by awe inspiring wilderness. As Christians, we also must venture out into the wilderness; one that is both a challenge and an adventure. What is ‘wilder’ than setting out on a path with Jesus Christ as his disciple? Interactive and experiential workshop will be offered by gifted young adult educators in the Ukrainian Catholic Church from across Canada. “Taste of the Eparchies” – An event in which each Eparchy can showcase their talent, their accomplishments within the Church, and their hospitality. All Ukrainian Catholic Young Adults (ages 18-35) are invited to share in the weekend. Attendance is anticipated from post-secondary students, young professionals and young married couples. The weekend is being planned to accommodate 150 participants. Wilderness Edge Retreat Centre is located in Pinawa, MB. Wilderness Edge provides a tranquil retreat from hectic city life. Step outside our doors and take in the stunning river and boreal forest views. 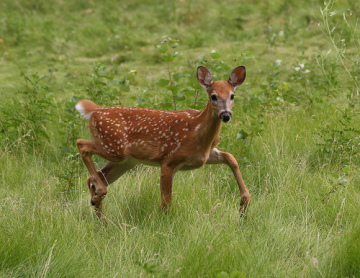 Find yourself in awe of the many deer and wildlife that wander their property. Welcome! Over the past few weeks we have been making a lot of changes to this site, and we plan to make a lot more in the next few weeks. Please look around, and think of suggestions for us. Once you have them, please contact Millie at the Youth Ministry Office. who is the “Youth Commission”?